French painter and collector. His father, Jean-Baptiste Havet, a doctor of Armenian origin, died when Aved was a child. He was brought up in Amsterdam by his step-father, a captain in the Dutch Guards. At 16 he is said to have become a pedlar or camelot (hence the nickname Camelot given to him by his French acquaintances) travelling through the Netherlands, drawing portraits at fairs. In 1721, after spending short periods in the Amsterdam studios of the French engraver Bernard Picart and of the draughtsman Franois Boitard, he left the Netherlands to work in the Paris studio of the fashionable portrait painter Alexis-Simon Belle. At this time he met other notable painters including Carle Van Loo and the portrait painters Maurice Quentin de La Tour, Jean-Baptiste Perronneau and Jean-Etienne Liotard. 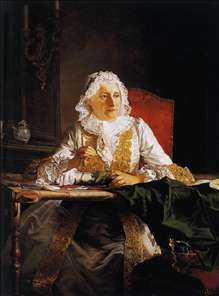 He also formed a deep and lasting friendship with Jean-Simon Chardin, with whom he may have collaborated on occasion; they used similar techniques, and he may have encouraged Chardin to turn from still-life painting to figure painting in the 1730s. He was accepted (agr) at the Acadmie in 1731, and received three years later on presenting portraits (now at Versailles) of Jean-Franois De Troy and Cazes, the master of Chardin. It is customary to link Aved and Chardin, rightly, because the two men were friendly. Chardin painted Aved s portrait, and Aved owned some of his still-lifes. Yet Aved seems to have been friendly also with Boucher and Carle van Loo, at least in these early years. His patrons proved quite often to be royal or at least noble; ambassadors like Count Tessin sat to him, and Louis XV commissioned a portrait which, however, caused Aved trouble and which took long to complete. It may well be that court portraiture as such did not suit him, but he travelled to The Hague in 1750 to paint the Stadhouder William (Amsterdam) - with rather conventional results. See more details about "Madame Crozat"